Attend EDIBLE BAZAAR BENEFIT - NY African Restaurant Week Kick-off event , 6:30 PM - 11:59 PM on Tue, Apr 29 2014 @ Suite 36 , New York, New York, United States Purchase tickets at the door NY African Restaurant Week featuring "The Edible Bazaar Benefit" by Panla, New York African Restaurant with Edible Brooklyn and Edible Manhattan of Edible Communities. 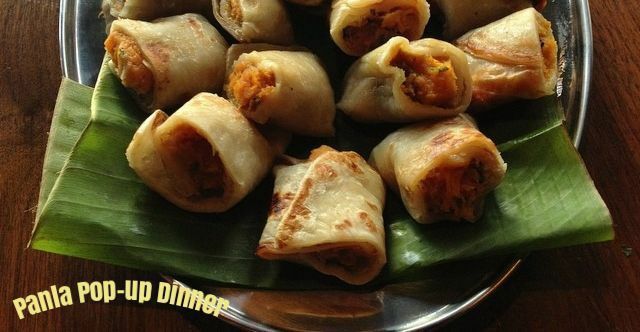 Come Excite your Taste Buds with Food from North, South, East, and West. Come and Enjoy a "Taste of Africa" at the Edible Bazaar Benefit the official kick-off event for NY African Restaurant Week. Sponsors Applause Africa MUIPR, Face2Face, Sahara Reporters, MUIPR, IBOM LLC African AfricanSoul Jam, CYAL, Event Planning & Publicity by: Wilson Marshall Inc. Tuesday, April 29th, 2014 6:30 - 10:30 PM Suite 36 16 W. 36th Street (bet. 5-6th Avenue) New York City Business/Cocktail Attire with Spring Chic Join an international melange of professionals, business executives, foodies, socialites and others from across the globe to DINE, DRINK & DANCE with music by DJs Universe & SM at a festively decorated African palace while enjoying tastings from caterers & restaurants of the African diaspora including: Barbara Food Creations, Farafina Cafe and lounge, Madiba Restaurant, Mombassa Dishes, Panla Catering and Pierre Birane Thiam Catering. 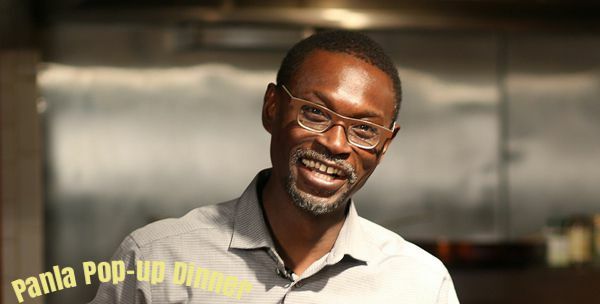 The Spring 2014 honorees include: Mohammed Abdullah (Owner, Accra) Mark & Jenny Henegan (Owners, Madiba Restaurant) Chef Pierre Thiam (Chef, Caterer and Award-winning Author) Dr. Roy Hastick (President/Founder, CACCI) Ramatu Ahmed (Community Organizer) The evening festivities will be hosted by Yolanda Sangweni & Namo Skee. "The Edible Bazaar Benefit" will donate a percentage of ticket sales to Keep a Child Alive and the Alliance of Hope for Lupus. Tickets on sale now at: www.beuevents.com Tastemaker Ticket, $50 (one Benefit ticket includes: unlimited cuisine, evening presentation and dancing) Executive Tastemaker Ticket, $200 (two Benefit tickets includes: one drink ticket, per ticket holder, unlimited cuisine, evening presentation, dancing and name and title/company/organization included on Benefit web page, video presentation at Benefit and discounts on personal chef services.) 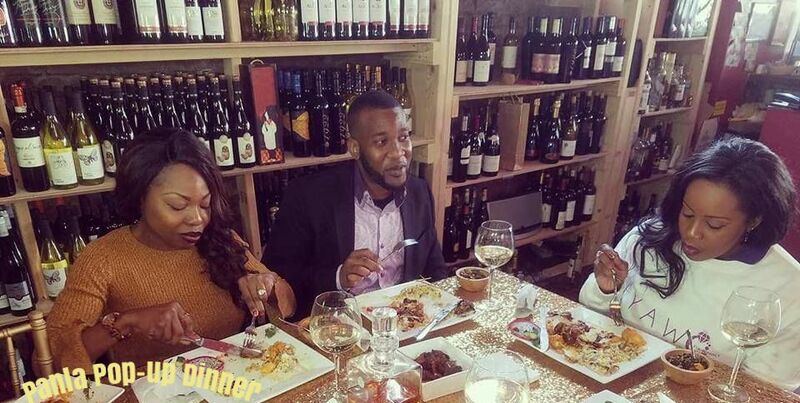 About New York African Restaurant Week: The NY African Restaurant Week (NYARW) is brought to you by Panla and A Taste of Africa USA. 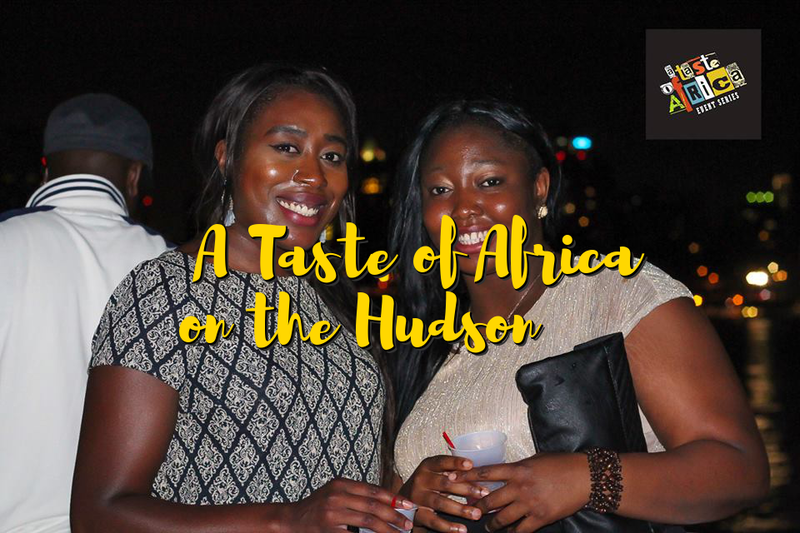 It is a bi-annual cultural event inviting people from all over to celebrate the best of African cuisine, wine, chefs, artisans and restaurants across the city. During this week, foodies, travelers, Afropolitans and more, purchase vouchers online or directly at participating restaurants and are treated to some of the best African dishes served in NYC. NYARW also features various events at different venues across the city that showcase Africa as it relates to food, art, travel, fashion and more. NY African Restaurant Week featuring "The Edible Bazaar Benefit" by Panla, New York African Restaurant with Edible Brooklyn and Edible Manhattan of Edible Communities. Come Excite your Taste Buds with Food from North, South, East, and West. Come and Enjoy a "Taste of Africa" at the Edible Bazaar Benefit the official kick-off event for NY African Restaurant Week. Join an international melange of professionals, business executives, foodies, socialites and others from across the globe to DINE, DRINK & DANCE with music by DJs Universe & SM at a festively decorated African palace while enjoying tastings from caterers & restaurants of the African diaspora including: Barbara Food Creations, Farafina Cafe and lounge, Madiba Restaurant, Mombassa Dishes, Panla Catering and Pierre Birane Thiam Catering. The evening festivities will be hosted by Yolanda Sangweni & Namo Skee. 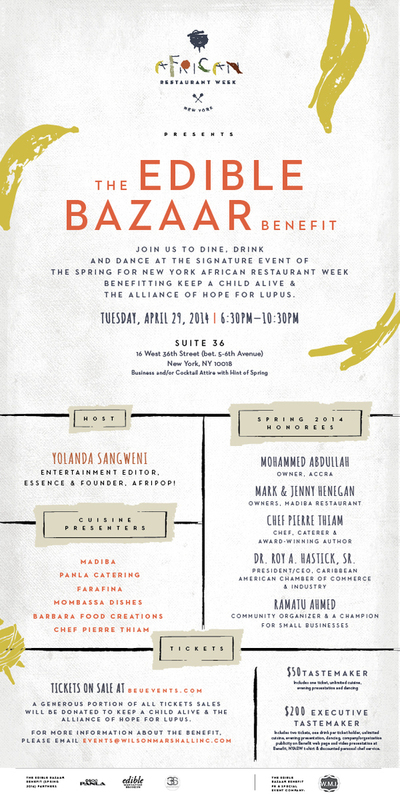 "The Edible Bazaar Benefit" will donate a percentage of ticket sales to Keep a Child Alive and the Alliance of Hope for Lupus. 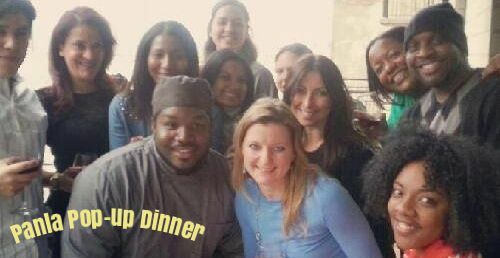 The NY African Restaurant Week (NYARW) is brought to you by Panla and A Taste of Africa USA. It is a bi-annual cultural event inviting people from all over to celebrate the best of African cuisine, wine, chefs, artisans and restaurants across the city. During this week, foodies, travelers, Afropolitans and more, purchase vouchers online or directly at participating restaurants and are treated to some of the best African dishes served in NYC. NYARW also features various events at different venues across the city that showcase Africa as it relates to food, art, travel, fashion and more.